Wake up in the middle of the night and cannot go back to sleep? Or perhaps pain keeps you awake? There truly is an answer, and it is not drug dependency. People who meditate have better sleep quality. And yoga and progressive relaxation also promote good sleep. But so what! If you have pain or restless sleep habits, your mental health is suffering. University of Wisconsin scientists observing sleep-deprived rats found that important problem solving brain regions fell into *local sleep. * This very same condition also occurs in sleep-deprived humans. Sleep problems and insomnia tend to increase with age, affecting 40% of women and 30% of men. But there is a drug free remedy. Audio MP3 brainwave trainings have been proven to restore healthy sleep patterns. How? 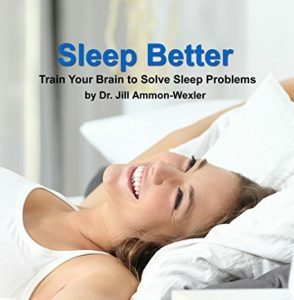 Doctor Ammon-Wexler has for 48 years worked with sleep deprived people. Her results have been amazing. Even chronic pain is manageable without drugs…and good sleep is possible! Audio 1. Go to Sleep. Sleep problems and insomnia tend to increase with age, and affect 40% of women and 30% of men. Good sleep habits are necessary for your nervous system to work properly, and to maintain the strength of your immune system. A relaxation session to prepare your body for far easier sleep. Spoken by Dr. Jill Ammon-Wexler, 8 minutes. There are several brain conditions that tend to disrupt sleep. One of the most common in our highly stressful times is “mind chatter.” You can use the *Calm Mind Chatter* audio in this collection to solve this problem. It will not put you to sleep, but is intended to calm an overactive mind prior to going to bed. If it is hard to go to sleep because your mind is racing from one thought to another, this will improve your sleep and help you feel much sharper in the morning. No more AM brain fog. Takes you straight into soothing Alpha brainwaves for a short restful nap. No earphones required, 10 minutes. Ever find your brain fogging up about 3:00 in the afternoon? That is the result of a battle in your brain. One army of brain cells and biochemicals is trying to keep you awake, while the other army is trying to force you to take a nap. It is true that a nap can make you more alert and productive. A nap was found to improve the performance of NASA pilots by 34 percent. Will not put you to sleep. This brainwave audio will help calm an overactive mind prior to going to bed. Close your eyes. Earphones are required, 16 minutes. Do you toss and turn while trying to go to sleep, or have restless leg syndrome or nighttime leg cramps. This is the result of the second most common cause of insomnia. Basically your brain is not producing enough of a specific band of brainwaves in the 12 to 15 cps SMR frequency. Deep Alpha and Theta brainwaves with a music overlay and dual subliminal messages. For those with difficulty relaxing. Earphones recommended, 10 minutes. This brainwave audio will ease you into a deep sleep, regardless of pain or discomfort. Moves gradually into deeper brainwaves. No earphones required, 10 minutes. Shopping is totally safe on Amazon!